Even though we typically swim naked, we always end up coming out of the pool covered head to toe. And Bleach Smell isn’t exactly our preferred fragrance. Not to mention the fact that chlorine makes our skin itch and dries out our beloved silky locks. That’s why we’re packing SwimSpray with us everywhere we travel this summer. 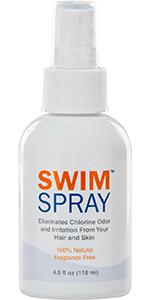 From our own backyard swimmin’ hole to the fanciest resort pools on the planet, SwimSpray will be the savior of our skin and hair. Simply jump in the shower after exiting a chlorinated pool. Apply 20 to 30 spritzes of SwimSpray to hair and skin, rub in, then rinse. Easy as that. The chlorine odor and residue are completely removed. Besides, we need all the help we can get to even achieve the slightest tan, so the less bleaching effect we have, the more Baywatch-ready we’ll be. Rockin’ a red one-piece and everything.